BUHARI-BAKARE: STRANGE BED FELLOWS OR AN ACT OF GOD? | ItuaLive! BUHARI-BAKARE: STRANGE BED FELLOWS OR AN ACT OF GOD? Misery acquaints a man with strange bed fellows”: A quote from “The Tempest”, a play written by William Shakespeare in 1610 helps provides an insight into the alliance between parties whose union is perceived as bizarre. In 1850, Charles Udley Warner in an adaptation brought it closer to poilitics when he said, “Politics makes strange bedfellows”. He likened this union to an unlikely or an unholy alliance. Unlikely rather than unholy is the conclusion I came up with when I considered the decision by General Muhammadu Buhari to pick Pastor Tunde Bakare of the Latter Rain Assembly as his running mate in the forth coming elections. The news sent tongues wagging in political, religious and social circles. This pair has altered the political landscape making it a bit more interesting. Before now it would have been an easy ride for the GoodLuck Ebele Jonathan (GEJ) campaign after Mr. President saw off Atiku Abubarka in the PDP primaries which turned out to be an anticlimax. General Buhari who is regarded as a high handed religious bigot by some Christians has tried to douse the negative attention on him by picking a Christian as a running mate. And not just any Christian, a man of God who many have come to recognize as Jeremiah the prophet of our times. Some see this move by the Gen Buhari Camp as a master stroke from a genius while others have been quick to rubbish the union as child’s play. In the wake of the failed alliance among opposition parties and especially the seemingly weak running mate-Mr Sunny Ugochukwu- picked by Mallam Nuhu Ribadu of the Action Congress of Nigeria (ACN), the Peoples Democratic Party (PDP) may be coasting home to victory except Buhari and Bakare gives them a fight. The corresponding answer should be, why not Bakare? Tunde Bakare is a fiery and respected man of God. He has gained a reputation as an iconoclast. Bakare is a principled man and perhaps the only preacher who can say to any government, “you are wrong”. He is feared as much as revered. Tunde Bakare is the convener of the Save Nigeria Group (SNG), and his civil rights movement rescued Nigeria from the claws of the infamous cabal in the Yar’Adua administration. He was an unrelenting critic of the Obasanjo administration, and was arrested by the SSS because of pronouncements considered to be “anti government”. He studied law at the University of Lagos thus making him an authority in the laws of men and his calling as a Pastor, a teacher of the laws of God. Some public commentators like Sam Omatseye of the Nation Newspaper in his essay, Tunde Bakare: Loner or Saint? refers to the man of God as a rebel. I prefer nonconformist radical. As a child, Bakare chose not to conform to the powers of death as he is the sole survivor among nine siblings; he abandoned his first religion- Islam-when he converted to Christianity in September 1974. He turned his back on his Baptist roots by opting rather to speak in tongues the charismatic way and mover over to the Deeper Life Bible Church. When things began to look too conformist, he decided he wasn’t too comfortable with the doctrines of the church and went over to the Redeemed Christian Church of God (RCCG). He fell out with his boss, Pastor E. A. Adeboye and went ahead to found his own ministry. Bakare wants to preach an unbridled, unadulterated gospel. The type preached in the book of the Acts of the Apostles and passed down by Christ himself. No gimmicks, no showmanship, no loyalty to man but God alone. 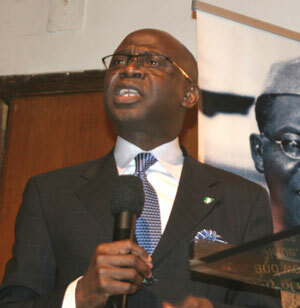 Tunde Bakare, unlike most popular men of God has not shied away from being a social and political commentator. His TV evangelical programme, Moment of Truth has seen over two million viewers glued to their TV sets every week. His views on front burning issues concerning the nation have been indeed inspiring. Like the anti establishment priests of old, Bakare has followed the steps of Martin Luther and Gustavo Gutierrez, in their passion to see people live free from tyranny, oppression and hegemony. He has galvanised protesters against government and has made friends with “unbelievers” like chief MKO Abiola, Gani Fawenhinmi and Wole Soyinka- a secular humanist- (what ever that means) in a bid to see a better Nigeria. It seem that Bakare like any politician likes the spotlight. Perhaps, this is what he was born for. Yet he has remained true to his calling. Never for once making uncalculated statements or gotten carried away in the euphoria of praise. He has not cared whether his actions will reduce his church follower ship; he believes what he is doing is right and he is determined to see it through. If there is any man out there ready and capable to take on the mantle of leadership, that man is Bakare. Tunde Bakare is married to one wife, Olayinka and they have five children. Some have lambasted Bakare openly suggesting that a Cleric should not be soiled by the murky waters of Nigerian politics. The Bible, they claim forbids the mixture of light and darkness. What will happen to his flock? Why is he playing second fiddle to an Islamic fundamentalist? These are some of questions that have continued to trail Bakare’s venture into politics. In my opinion this questions are unfounded and at best depict ignorance on the side of his critics. First and foremost, Bakare is exercising his fundamental rights to vote and be voted for. Further more, if we decide to consider typical examples in the Bible, Bakare would come out vindicated. Daniel in the Old Testament was Prime Minister in Babylon, a highly sinful and perverse government. He was a beacon of light in darkness. And When Babylon was divided he still retained his position in the subsequent governments in Persia. Was light not mixing with darkness then, I would like to ask these people? Other examples of righteous men who were in the forefront in political circles include Joseph who also became a Prime Minister in the land of Egypt. He saved thousands if not millions of lives because he responded to the call of leadership. Should Bakare refuse this call because he is to work behind a “Pharaoh”? Edmund Burke once said: “People who say nothing in the face of tyranny must endure the rule of idiots”. Bakare has decided to say something and should not be condemned. Those who argue that Bakare would not be effective as a deputy should take a look back in history. If we cast our minds back to the Buhari’s government in 1983-1985, it was Idiagbon his deputy (Chief of Staff) that called the shots. In fact it is popularly called the Idiagbon-Buhari administration. As the head of the Petroleum Trust Fund (PTF), Buhari excelled not by what he did personally, but by putting the right people in place to work with him. Buhari first came to limelight in 1975 when he became the Minister of Petroleum (or Federal Commissioner for Petroleum Resources) under the then Head of State, General Olusegun Obasanjo. Major General Buhari was selected to head the country by middle and high ranking military officers after a successful Coup d’etat that over threw President Shagari on December 31 1983. His administration initiated a public campaign against indiscipline known as “War Against Indiscipline and Corruption” (WAI). Nigerians believe this to be the most orderly and law abiding period in Nigerian history to date (koboko induced or not). As PTF chairman, Buhari ran one of the most successful government Parastatals. Some hospital mattresses and bunks actually still have PTF logos on them. Virtually all the well tarred roads in the north are PTF funded. Buhari is perhaps the only Nigerian politician who has not joined in the zoning debate. He has asked Nigerians to vote for the best candidate regardless of where they hail from. He has also not cashed in on the Presidents GEJ’s perceived lack of experience relating to security issues against him. No words of calumny or condemnation were used against GEJ by Buhari after the October 1 and New Year Eve Bombings. These statements are credited to General Buhari when he called for the full implementation of Sharia law across Nigeria. As a Christian I find this very disturbing. Nigeria is a secular state and is neither a Christian nor Moslem country. His pronouncements have done him no favors in winning voters to his side. Buhari, who has also been quoted asking Moslems to vote along religious lines, has been called several unpalatable names by Christians and opposing politicians. This is perhaps what instructed the choice of Bakare as a running mate. As much as I like Buhari, I have also found this bitter pill very hard to swallow. Nobody wants to be whipped by “koboko” for drinking Moet, or have his limbs slashed for stealing a goat or worse be stoned to death for committing adultery only to find out later that they are Christians. We are after all under Grace and no longer under the Law (Praise God!). In fairness to Buhari, it was actually when Nigeria had a Christian President (Olusegun Obasanjo) that Sharia was introduced. And his statements were a follow through to what already was obtainable. My only solace is that God can use anybody. He used a certain Cyrus, an “unbeliever” and even went as far as calling him “my anointed” after he commissioned Cyrus to rebuild Jerusalem in Isaiah chapter 45. This means that whether Christians love Buhari or not, if he is “anointed” by God for the liberation of this Country, then he will do a splendid job as president. The Buhari-Bakare (BB) ticket has one strong asset-integrity-which may deliver votes in the April polls. They are both seen as honest, not corruptible, disciplined and having credibility. The average Nigerian politicians with their desultory characteristics in search of what they can “chop” have diminished confidence in the political class. And only something new and unadulterated can instil the much needed confidence required to drive the Nation forward. Voting for the PDP will not bring any monumental difference in this country. Not because Jonathan is not the right man for the Job but one is only as good as the person around him. If GEJ and Sambo can completely extricate themselves from the pack of hyenas then maybe some good will come but since that is unlikely, the viable option will be to look in the CPC’s direction. At least we know that the Buhari and Bakare will not give or take bribes or award contracts to their family members. We know that if the EFCC finds anybody culpable, they won’t seek clearance from the executive arm of government before investigating as in the case of Dimeji Bankole and the Dino Melaye’s lead group. Politics in Nigeria as any where else is simply a game of numbers. The CPC does not have the necessary clout or machinery to deliver at National level. Their campaign offices are domiciled predominantly in the Northern part of Nigeria and representation down south (South-South, South East most especially) is merely skeletal. With this to consider, it would be rather optimistic for anyone to think the CPC can pull an upset. History has proven that the north alone can not deliver a victory on its own. Sentiments can not be expunged from Nigerian politics. I bet we would soon begin to hear about all the human right crimes the Buhari administration committed. His comments on Sharia would be replayed over the radio and TV sets soon enough. Tunde Bakare would be advised to go back to his church. Nobody will discuss developmental issues. Nobody will mention the derelict power sector or that our Universities are graduating illiterates. It would be a war of words over nothing. And in that war, Bakare and Buhari will lose. I don’t see either of them engaging smear tactics in their campaigns. Thirdly and most importantly is the money factor. Money is a key ingredient during campaigns. The PDP has enough money to throw around. They can run TV and Newspaper ads indefinitely. They will print more posters and have the finances to reach the creaks of the Niger Delta. If it comes to ballot stuffing, the PDP can pay more thugs even under short notice. Will Bakare and Buhari collect campaign money from thieves? I think not. As the April polls inch closer, the political climate in the country has grown thicker. I still haven’t decided where my vote will go as far as Presidential election is concerned. I feel my vote will count this time around and that has not made the decision any easier. I could decide to take it down to a ballot. Goodluck, Buhari, Ribadu, and the winner is…….